An attorney admitted to practice of law residing in Becker County and selected by the County Attorney. The Board of Trustees' annual meeting is held each year prior to July 1st. The date and time of the annual meeting is posted in the Law Library and on the bulletin boards in the hallways of the Courthouse. 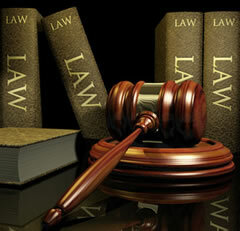 The Becker County Law Library is supported by law library fees paid in connection with the opening of court files in civil cases or, in criminal cases, when imposed on the defendant by the court following conviction. The Law Library is located in the basement of the older (southerly) section of the Becker County Courthouse in Detroit Lakes. The Library is open and available to the general public Monday through Friday, from 8:30 a.m. to 4:30 p.m. The only exception to the schedule occurs when the Courthouse is closed on a weekday due to a holiday. The Becker County Law Library ("Law Library") provides resources to people who represent themselves in the Minnesota District Courts. The information found on this website, or in the Law Library itself, is not intended as legal advice, but only as general information about the law and legal reference services. Talk to a lawyer, if possible, before taking legal action to learn about your legal rights and options. There is no attorney-client privilege or confidentiality covering any information shared by a visitor and any Law Library personnel or individuals staffing the Self-Help Clinic (see "Self-Help Clinic" below). All such personnel or individuals must remain neutral and may provide services to all parties in a case. Such personnel or individuals are not responsible for the outcome of your case, or any case. You should consult with an attorney if you desire personalized advice or strategy, confidential conversations, or if you wish to be represented by any attorney in court. The Law Library tries to keep this website and the Library up to date, but makes no guarantees about the accuracy of the information and is not responsible for any consequences that may result from its use. If you are unsure whether you should use information found on this website or in the Law Library, you absolutely must obtain the advice of an attorney who is licensed to practice law in Minnesota. The Law Library makes no endorsement or warranty of quality of services by linking to an outside organization from this website.